Phoslab Environmental Laboratories offers formaldehyde testing and vapor monitoring for home or workplace. Formaldehyde, a type of volatile organic compound (VOC) is a colorless, flammable gas that is created as a byproduct of combustion and other natural reactions. It is known by its strong odor similar to pickles and exposure can lead to health risks. Because of the risks that exposure present, formaldehyde is regulated and violations can lead to hefty fines. In 2011, four Florida hair products companies – two manufacturers and two distributors – were cited by the U.S. Department of Labor’s Occupational Safety and Health Administration (OSHA) for more than a dozen health violations related to alleged exposure of employees and other downstream users such as salon stylists to possible formaldehyde exposure. OSHA criticized the companies for not providing adequate warnings to product users, proposing penalties amounting to nearly $50,000. Formaldehyde is produced when certain compounds, like natural gas, wood, tobacco, or kerosene are burned. An inescapable source of formaldehyde is automobile exhaust. Exposure happens when people breathe in the exhaust or the off-gassing of formaldehyde from everyday products. Businesses handling these types of products, or consumers who are concerned about their exposure to formaldehyde, should contact the experts at Phoslab Environmental to obtain an accurate reading. Compliance with these regulations is important and not taking them seriously can lead to fines like the Florida hair care products companies faced. In 1987, the EPA listed formaldehyde as a probable human carcinogen. In 2011, the U.S. Department of Health and Human Services determined that formaldehyde is in fact cancer-causing in humans. Some studies link it most strongly with certain types of leukemia. Even in cases where it does not cause cancer, formaldehyde can lead to a host of other unpleasant or dangerous health effects. Formaldehyde exposure does not affect everyone in the same way. Like other VOCs, the severity of the health effects depend on factors like how concentrated the formaldehyde is and how long the exposure lasted, as well as how sensitive the individual person is to the compounds. More prolonged or higher-concentration exposure can lead to asthma attacks, neurological problems, eczema, liver and kidney damage, and even cancer. Anyone experiencing symptoms related to formaldehyde exposure should consult with a doctor and people who are particularly sensitive to formaldehyde should avoid pressed wood or other products that emit it. In small amounts, formaldehyde is generally considered harmless to the public. Indoor and outdoor air typically contain a concentration of no more than 0.06 ppm, which does not harm most people. Concentrations at or above 0.1 ppm, however, can lead to skin, eye, chest, and abdominal irritation. 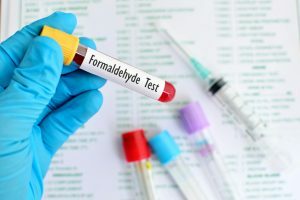 There are several methods to test for formaldehyde concentrations but their accuracy depends on gathering good samples. One method includes having an employee or other on-site individual wear a badge device that collects the formaldehyde that is within the employee’s breathing area. Alternatively, free-standing monitors can gather samples from a fixed location. Trust your formaldehyde testing to professionals like Phoslab Environmental. We can help you determine what collection method and analysis is right for your project. Ordering a formaldehyde test kit is a convenient way to get the reliability of a professional testing lab right from home. Our formaldehyde vapor monitor can easily identify if you are inhaling harmful vapors in your home or office. Simply place the monitor in the suspected area for at least 24 hours. Next, using the envelopes provided, send back the monitor to our formaldehyde testing laboratories. Once the testing labs process the monitor, the results are sent back within 48 hours. Whether you are responsible for a business or concerned about your household, testing for formaldehyde inhalation is hassle-free, affordable, and valuable. Contact Phoslab Environmental for more details on how to set it up. Phoslab Environmental Laboratories brings you state of the art methods and unrivaled accuracy. We stay current on the demands of environmental regulations to help you stay compliant. For more information on how we can help you, contact a professional now by calling 1-863-279-4571.